It's a hot July, 2013 day in Kingston, Rhode Island. 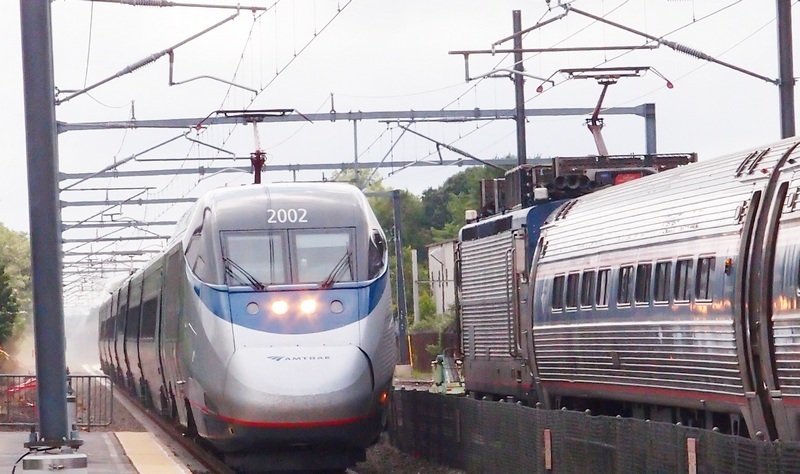 Here's a pic of an Acela approaching at full speed (c. 120mph?) passing a stopped Regional Express in the station. Now and then photographers get lucky. I was testing a new compact camera for travel and its digital zoom, a feature that is often panned, but it caught the oncoming Acela in full and powerful flight....note the cloud of dust behind it...before I could step back a few feet and avoid maybe the best way a rail photographer can go on to the next world! 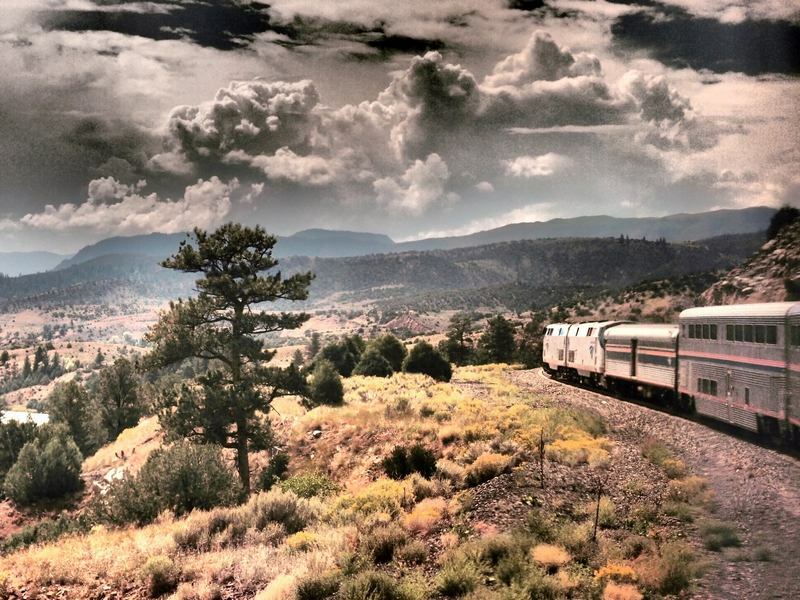 In mid-September, 2013, I took a long trip around the American West by plane, bus and trains. The photos here were taken from and on the California Zephyr on its last trip from Denver through the Rockies before the horrific floods (note the scary rain clouds) took out the tracks west of Boulder. The train itself was impressively full with folks from all over the world. The windows were spotless, the crew (and station staff) acted as though they had customer service training, and the food was surprisingly good and fairly priced. 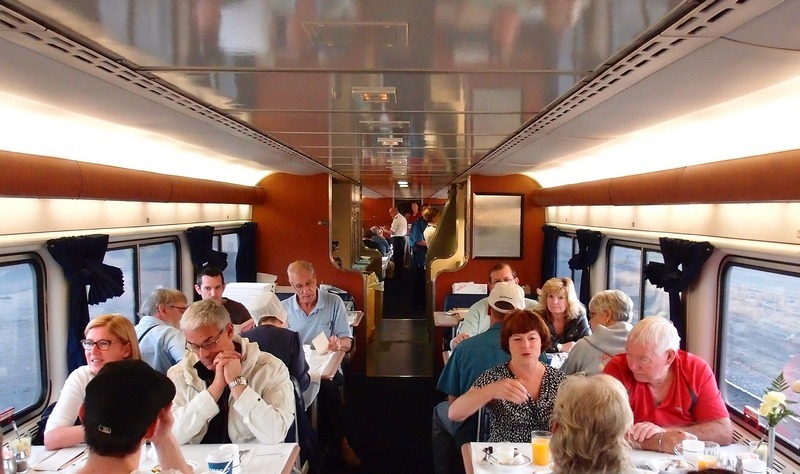 There were few glitches, though to this day I cannot figure out why the cafe was closed during much of the breakfast hour, when it was almost impossible for a humble coach passenger like yours truly to get a reservation and had to forego coffee until after I got off the train. Because of the floods I had to take a bus from Reno to Sacramento, where I picked up a Cap Corridor train to the Bay Area (and later took one back to Davis). Though the Cap Corridor trains were up to their usual pleasant standards, I was surprised by the fact that the platforms in the Sacramento station have been moved almost as far as the Oregon border, and there was no help for those of us who got off the Amtrak bus (several passengers were very old or had disabilities) from Reno, with just a few minutes to spare. I might also add that the process of changing over from the CZ to an Amtrak bus was more complicated than using the new government healthcare website. The Amtrak people on the phone seemed clueless, though about 20 minutes on the cell phone got things sorted out. One word to the wise. 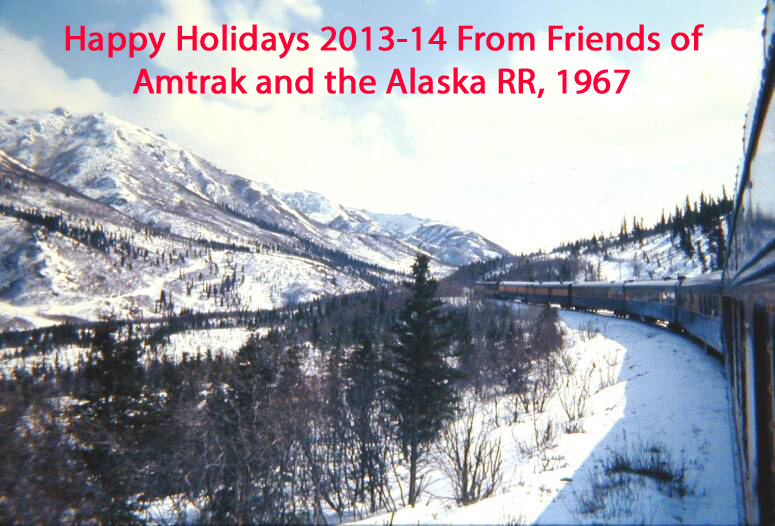 If you are planning to use Amtrak to cross the country check prices well ahead of time. My hope was to go from Boston to Emeryville in a sleeper, as I did several years ago. At $1700 one way I could probably ride the QE2 across the Atlantic in style. My round trip air fares on Jet Blue and Southwest, both of which are good airlines, cost less than $400. My coach tickets on Amtrak were well less than $200. I have been told that in the off season prices go down dramatically. As for the photography, I used a small Olympus XZ-1. What's a photographer to do in the midst of a frigid and snowy New England winter when driving to far off spots to shoot trains isn't very practical? Well, this one goes to the health club in Westborough, MA for a nice warm bunch of laps in the pool and then ducks around back to shoot trains on the Boston-Worcester line, hot coffee in one hand, camera in the other. So here's a shot today (January 26, 2014) of a gleaming, on time and friendly (the engineer is getting to know me so lots of little toots when he spots me) Boston section of the Lake Shore. 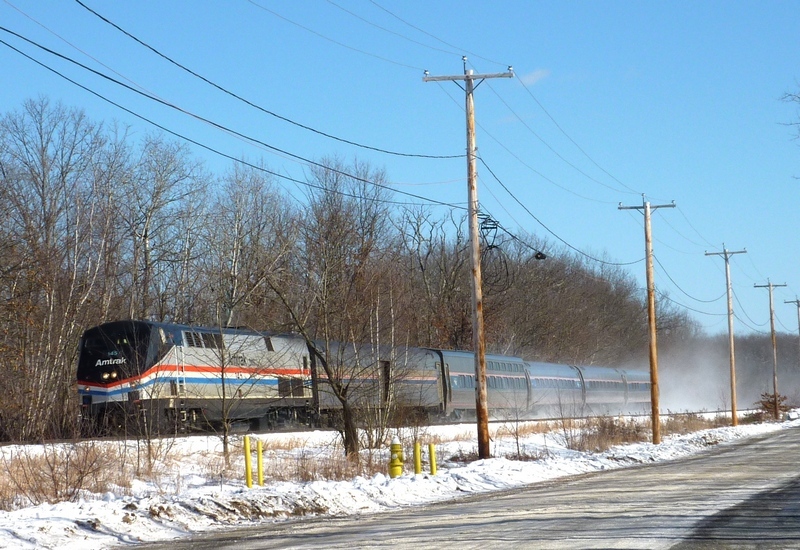 Amtrak has survived much of the craziness in Washington and slowly but surely passenger service in New England is picking up steam....at least it is in Massachusetts where there will soon be 40 trains a week day between Boston and Woosta and new commuter lines will be opening. Hopefully, a decent service between Boston and Springfield, with easy connections to New York is in someone's cards. Changes last made on: January 29, 2014. The counter below indicates the total number of visits to this page since April 29, 1996.